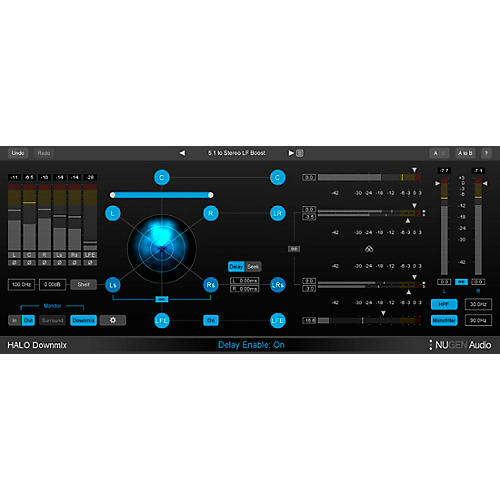 NuGen Audio NUGEN Halo Downmix with 3D Immersive Ext. Earn up to 1,995 reward points. Extensive downmixing capability with 360-degree sound support. Halo Downmix provides a highly creative solution for precise downmixing of feature-film or 5.1 mixes to stereo. Intuitive, visual controls for relative levels, timing, and direct vs. ambient sound balance allow unprecedented fine-tuning, delivering accurate down mixes that are no longer limited by typical in the box coefficients-based processes. The Downmix 3D Immersive Extension introduces additional vertical controls via an expanded user interface including control over Ltm and Rtm placement for Dolby Atmos compatible placement. An additional real-time analysis view is also included for the vertical dimension, showing energy distribution of the output audio. Halo Downmix 3D Immersive Extension provides a highly creative solution for precise downmixing of 3D mixes to stereo. Donwmix with Dolby Atmos compatibility!